If you want to grow your own fruit, a great place to start is by growing blackberries. 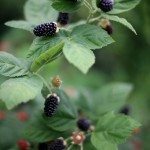 Fertilizing your blackberry plants will give you the highest yield and the largest juiciest fruit, but how to fertilize your blackberry bushes? Read on to find out when to fertilize blackberry bushes and other specific blackberry feeding requirements. Berries, in general, are nutritious, and blackberries have been shown to help fight cancer and cardiovascular disease as well as slow down aging of the brain. Today’s new cultivars can even be found thornless, erasing those memories of torn clothing and scratched skin while harvesting their wild brethren. Easier to harvest, they may be, but to get that bumper crop, you need a fertilizer for blackberries. First things first, though. Plant your berries in full sun, allowing plenty of room to grow. The soil should be well-draining, sandy loam rich in organic matter. 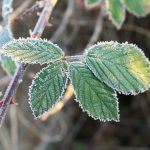 Decide if you want trailing, semi-trailing or erect berries and thorny or thornless. All blackberries benefit from a trellis or support so have that in place as well. How many plants should you get? Well, a single healthy blackberry plant can supply up to 10 pounds of berries per year! Now that you have planted your selections, what are the feeding requirements for your new blackberries? You don’t begin fertilizing blackberry plants until 3-4 weeks after the setting of new plants. Fertilize after growth starts. Use a complete fertilizer, like 10-10-10, in the amount of 5 pounds per 100 linear feet or 3-4 ounces around the base of each blackberry. Use either a complete 10-10-10 food as fertilizer for your blackberries or use compost, manure or another organic fertilizer. Apply 50 pounds of organic fertilizer per 100 feet in the late fall prior to the first frost. As growth starts to appear in early spring, spread inorganic fertilizer over the top of the soil in each row in the amount as above of 5 pounds of 10-10-10 per 100 feet. 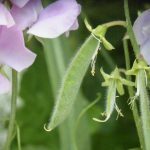 Some folks say to fertilize three times a year and some say once in the spring and once in the late fall before the first frost. The blackberries will let you know if you need a supplemental feeding. Look at their leaves and determine if the plant is fruiting and growing well. If so, no fertilizing the blackberry plants is necessary.